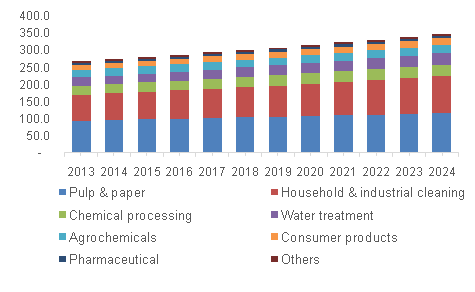 Chelating Agents Market Worth $5.17 Billion By 2024: Grand View Research, Inc.
San Francisco, United States, 2018-Sep-14 — /EPR Network/ —The global chelating agents market is expected to reach USD 5.17 billion by 2024, according to a new report by Grand View Research, Inc. Increasing requirement for chelating agents in cleaners & detergents to boost the performance of the finished product is expected to drive growth. Increasing demand for cleaners & detergents in the household and industrial applications on account of rising consumer awareness regarding hygiene and extending the lifespan of equipment by keeping it clean is expected to bolster demand. Household & industrial cleaning is anticipated to account for 25.4% of the volume by 2024. Agrochemicals are projected to witness gains at a CAGR of 3.6% from 2016 to 2024, on account of increasing agriculture practices. Chelating agents are used as pesticides and insecticides to promote plant growth. Introduction and implementation of Integrated Nutrient Management (INM) and Integrated Pest Management (IPM)practices to increase crop yield by governments across the globe is expected to boost market demand. Pharmaceutical is anticipated to be a potential market for chelating agents over the forecast period on account of increasing government spending on providing primary healthcare facilities to its citizens. Pharmaceuticals market is estimated to be valued at USD 114.6 million by 2024. Asia Pacific was the largest market and accounted for 38.5% of the global revenue in 2015. The region is expected to witness significant growth over the forecast period on account of growing demand from the detergent industry in emerging economies such as China and India. This factor has resulted in increasing production volumes of various manufacturers of chelating agents. North America was the second largest market and was worth USD 1.10 billion in 2015. Strict environmental regulations have influenced manufacturers to shift from conventional chelating agents towards bio-degradable agents. Europe followed North America and accounted for 21.8% of the global revenue in 2015. Key market participants include The Dow Chemical Company, Tate & Lyle, Kemira Oyj, AkzoNobel N.V., Archer Daniel Midland, Lanxess AG and Cargill Incorporated. In September 2015, ChemPoint EMEA B.V, a company engaged in sales marketing and distribution of specialty chemicals announced that it was expanding its marketing and distribution relationship with The Dow Chemical Company by providing formulation, sales and order fulfillment support for the company’s VERSENE which is food grade chelating agent and used in food applications.